Badlands Dinosaur Museum (Dickinson ND) is seeking to employ a fossil preparator (full-time) to add to its permanent paleontology staff. It is expected that the bulk of the preparation work will concern large dinosaur material and other vertebrates. Detailed job description, and information on applying can be found at the City of Dickinson page (below). 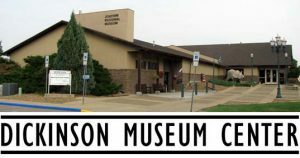 About the museum: The recently renamed Badlands Dinosaur Museum (formerly Dakota Dinosaur Museum; 1992-2015) was acquired by the City of Dickinson in December 2015, and hired curator Dr. Denver Fowler in April 2016. The museum is undergoing complete renovation and replacement of its exhibits and facilities, converting it into a public institution with an active fieldwork and research program. We conduct fieldwork on public and private lands in the Judith River and Hell Creek Formations of Montana and North Dakota, focusing primarily on vertebrate fossils. We have recently been provisionally approved as a federal repository for Judith River and Hell Creek fossils. Badlands Dinosaur Museum is part of Dickinson Museum Center, a 12-acre site focusing on paleontology and regional history. Most of our facilities are open year-round. We currently have six full time staff and a number of part time and seasonal staff.